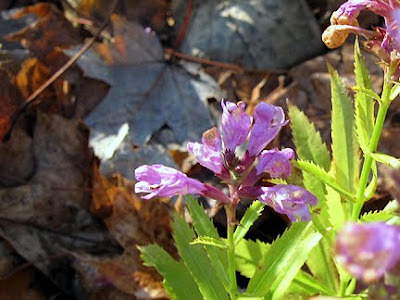 and obedient plant (which is normally done blooming way before now but this was in a location that was shadier most of the season). This photo is entirely gratuitous. 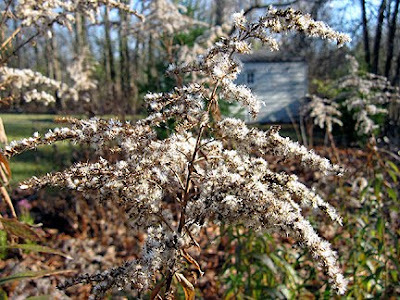 Canada goldenrod stopped blooming months ago, but I'm enjoying how long it's held its seed heads! 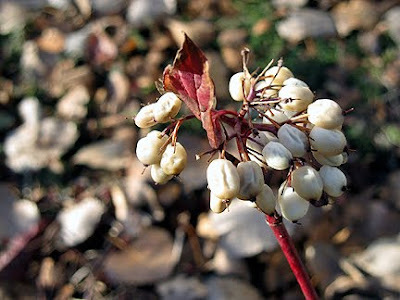 I'm also enjoying the white berries of my variegated red-twig dogwood, which were looking spiffy until yesterday. Even though I have more than enough Japanese anemone (eep! 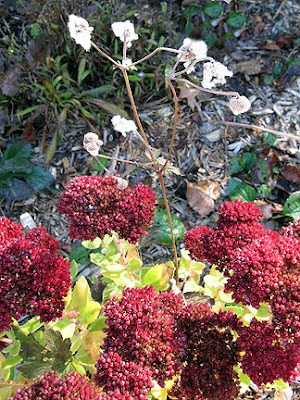 ), I love its fuzzy seed heads, especially against the dark pink of sedum. 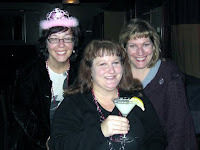 Elsewhere, I had my first-ever martini (mmm, lemon meringue) Friday night at a friend's bachelorette party. I figured, what with having had my first manicure earlier this year, I better get in another first before turning 44. Later that evening, we all danced, along with some college kids. I bet they thought we were hilarious. I sure did. And I can assure you that if you decided to dance in these shoes, you'd be bloomin' sorry! My right hip is sore, and I find pressing on it with my right hand helps when walking. Now all I need to do to complete the picture is wave my left fist in the air and yell out "Hey, you kids! Get off my lawn!" Garden Bloggers' Bloom Day is brought to you by Carol at May Dreams Gardens and the letters G, B, and D.
Good morning and a bit Happy Birthday to you!!!! A first martini-this is the year of firsts for you and why not? The timing of the party was perfect to think about your birthday and have one. Those shoes? 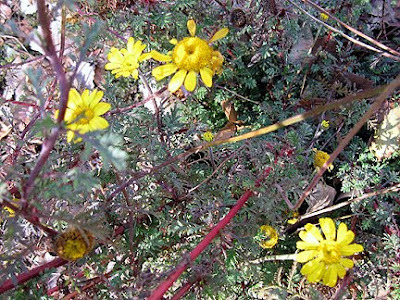 Take them off while you dance-just watch out for errant feet that can step on yours:) Great blooms. I love those dogwood berries and the cats-hey they are your blooms too! Happy Birthday, Monica! LOL, I'm picturing you dancing after that first martini--you know, I don't think I've ever had one either--bet those college kids were in awe of you all. Good thing they didn't see you holding your hip the next morning:) I can't walk in heels anymore, let alone dance in them! 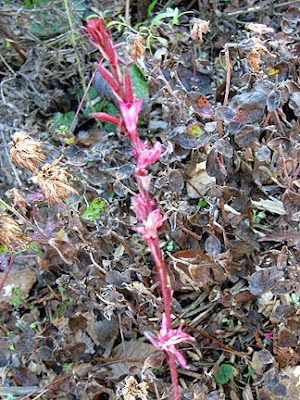 You still have lots of blooms in your garden, but I really enjoyed the goldenrod. I was going to show a photo, too, because I love its fluffy seedheads, but I couldn't get it to stop swaying in the wind enough to get it in focus. 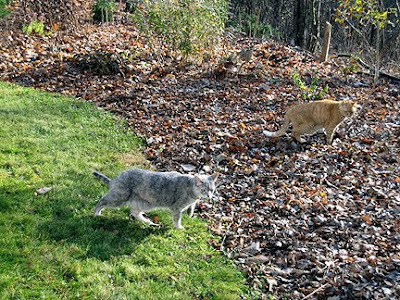 James and Fiona look like they're enjoying the leaf mulch as much as anyone. Have a great day, Monica--a blooming Birthday! Like Tina said, take off the shoes (next time.) 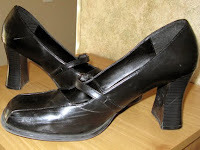 I have a couple of painful foot conditions, and while I still occasionally wear heels, they come off at the first opportunity. I wouldn't dream of leaving them on for dancing - I'd rather get stepped on, it's much less painful! Happy birthday my friend - I hope you have a wonderful day! Those cats look like they're up to no good. 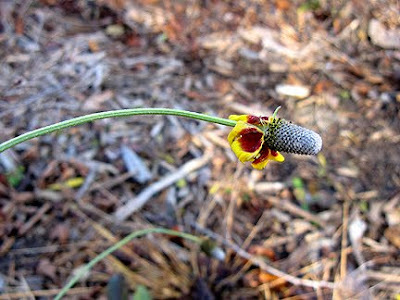 :) Your shot of the goldrod seedhead is gorgeous. 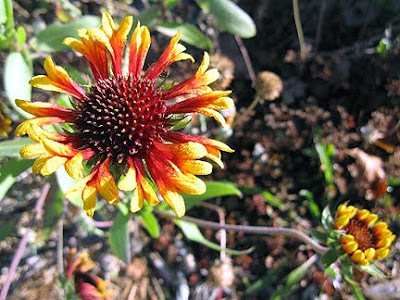 The shot of the Blanket Flower is beautiful too. Happy Birthday Monica! Have a great day! Among all your lovely blooms, I like the mums the most. Happy bloomin' Birthday, Monica! Enjoy the beauty of our shared Indian Summer and November birthdays (mine was the 13th)! Happy birthday! Sounds like another round of martinis is in order. Happy Birthday! It's also my birthday today woo hoo! Only I never got the chance to take any photos in the garden today with everyone coming round to see me!! Lovely photos and it's so nice to see things are still around flowering for you. Happy Birthday! I think your garden has made a very respectable showing for November. I love that Mexican Hat, it looks very tired. I wish I could enjoy the berries of my variegated red-twigged Dogwood, but the squirrels eat them all long before the leaves are gone. Happy, Happy Birthday! Oh to be that young again and able to dance in heels. :)Sounds like a fun time for all. Instead of just celebrating for a day-make it a whole week. I used to. I was surprised at how many blooms you still have. Nice to have those this late in the season. 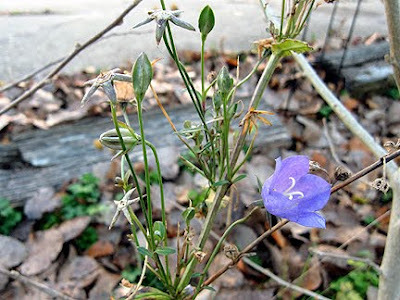 I am still finding an odd bloom or two hidden under something else. Your seed heads are gorgeous. S are the cats. They both look very well fed. Monika you crack me up with your description of wearing those shoes...they don't even have a high heel!! You should see what I wore back in day before arthritis hit my hips!! Any how I'm sure you had a wonderful day surrounded by buddies. I missed out on posting for NBD too tired to bend down in the garden right now. Hi there and Happy Birthday. 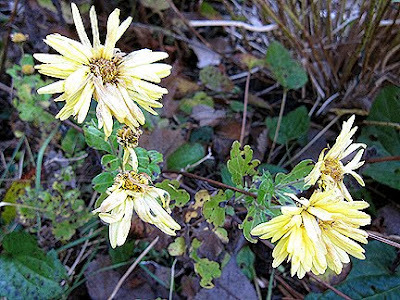 Great late fall post, you still got some lovely blooms out in the garden. Belated birthday wishes Monica. I hope you had a great one. The photos are beautiful. I especially love the goldenrod. Thanks for the great laugh! Looks like you're paying for your good times on your birthday but that's okay! We all have a little bit of that "get off my lawn" old person in us, ha! Happy Birthday Monica! Have an extended celebration today ... another Martini? A slightly belated Happy Birthday Monica - and I hope you had a lovely day filled with other 'firsts'! Monica, Happy belated and we almost share a birthday as mine is the 14th and Eliz from GWI is on the 13th so next year we can all celebrate together for a full week! Sounds like you had a memorable day and the blooms are lovely also. happy Birthday!! I know it's a bit late, but I have a good excuse...I've been away from the computer! I don't know how anyone could walk in heals...especially anything over 2 inches! Love the blooms on the variegated dogwood...If I am lucky I might have them in my garden some day~~thank you! gail ps ice that hip! We're delighted that your human shares the birthday date with our other type of human. Only very fine people get to celebrate on that date! We're sorry we're late, but we still want to concatulate: Happy Birthday, Monica!!! And thanks for showing uns around in your garden.